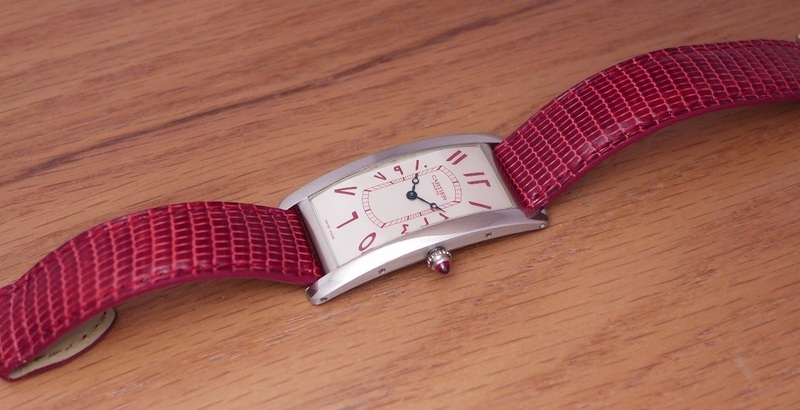 Cartier - A nice souvenir: Cartier Tank Cintrée platinum Red arabic numbers. A nice souvenir: Cartier Tank Cintrée platinum Red arabic numbers. From my meeting with our dear Géo, last year. This watch oozes class and beauty. If I had to get One Cartier watch, it would be this one. The only small issue? There were less than 10 made, according to what Geo told me. And I never saw one like this during all these years. I learn something new. It just shows I am a bad Moslem!!! My religion is fine Nico! It is I who is bad!! What a catch and such a pleasure you must have had to meet Geo. He is a treasure to the community. I owe my love of Cartier to his wonderful posts across the internet. This is just a beautiful watch. And unusual too which makes it all the more appealing. I believe I follow Geo on Instagram but was not aware he was active here (maybe I'm not following the Cartier posts closely enough). Amazing Cartier pieces on his IG, seeing his posts there has really made me thing about finding my first Cartier.